Live outdoors all year round with our frameless retractable terrace glass walls, sunrooms, solariums, and three-season rooms. Imagine enjoying breakfast outdoors in any season, or sending your children out to play even when it’s raining, or sitting with your friends and family in the sunroom enjoying a coffee and watching the sunset - every single evening. All of our sunrooms are fully customizable to suit your own personal style and needs. Enhance your home with a complete sunroom addition, or transform your existing covered deck into a sunroom with our frameless retractable glass. 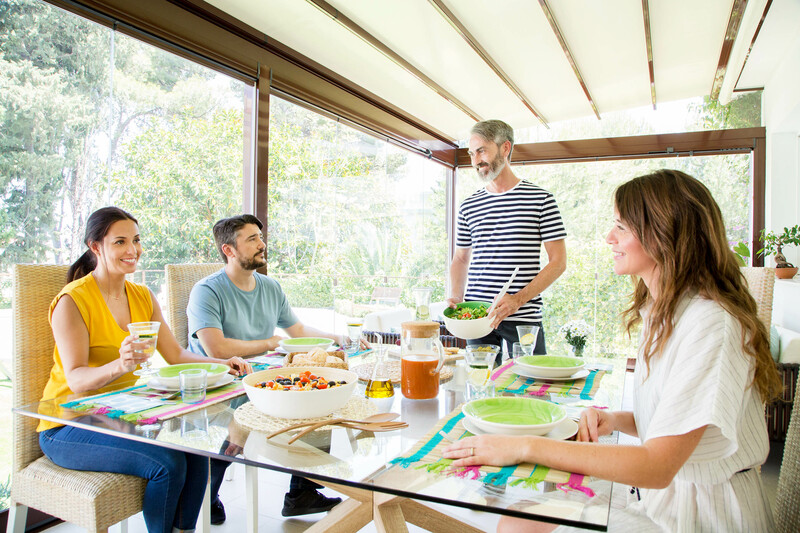 In the warmer months, you can open up your retractable glass completely and enjoy the fresh air and sunshine while still controlling the heat under your patio cover or existing covered deck. In the colder months, enjoy time in your sunroom without rain, snow, wind, debris, or leaves. 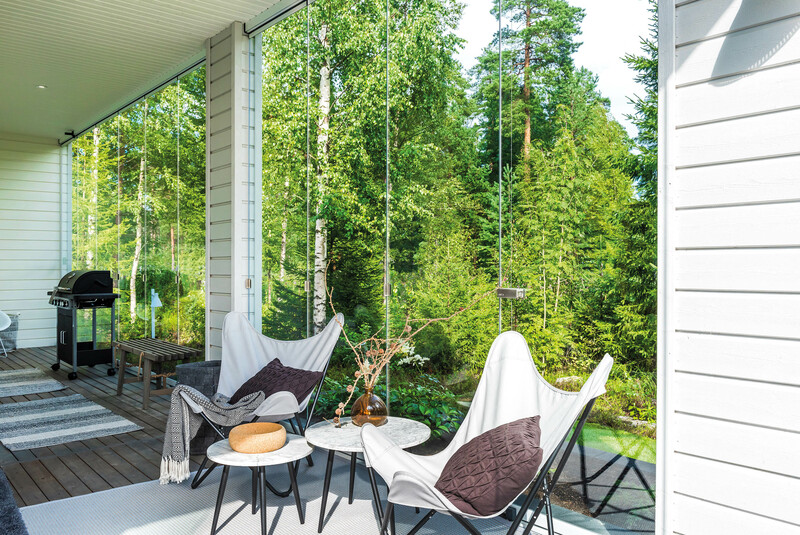 Create the outdoor living space that you’ve always dreamed of with Lumon’s frameless retractable glass. In addition to providing a convenient way to add space to your home, our retractable glass sunrooms and solariums offer many other benefits. A glass terrace is a new dimension to your home. A new living space that opens to the beautiful weather, outdoor space, and closes with a secluded mode in rain and wind. A glass terrace can serve even a large number of diners and functions well as a place to hold festivities. Keep in mind, however, that a glazed in terrace is an outdoor space, use furniture and decor that is moisture-resistant. The glazed terrace is also an ideal place to pre-grow summer flowers and take care of your kitchen garden. The enclosed terrace gives totally new possibilities for you to improve your housing conditions and living comfort – to increase ambiance and flair on the terrace. In cooler months, the glass traps the heat from the sun, contributing to the warmth in your home. And, of course, because the glass in our sunrooms is fully retractable, you can slide and fold the glass open at any time for fresh air and sunshine during the warmer months. A closed and locked terrace is a safe place for children to play and is a favorite. Even parents feel comfortable with the kids on the terrace. Whether you have a cat, poodle or guinea pig, an enclosed glass terrace or balcony offers a nice outdoor space for even the most sensitive pets. Glazing keeps your pet on the balcony, but they can still enjoy the outdoors and get stimulated by their environment safely. Safety glass and the option of locking the balcony provide additional security. Safety glass and the option of locking the door provide additional security for housing. A glazed terrace can store bikes and sports gear safely. The glassed-in terrace also protects the house facade and saves heating energy. Lumon customizes each glass terrace with pre-designed standard elements to fit in your home: terrace roof and body, with or without framed patio doors, balcony glass system and railings. Combined, these give you endless creative solutions to add space. The easiest way to get a glass terrace is to install Lumon glass wall elements to an already covered terrace. Sliding frameless or framed glass elements will transform your porch into a glass terrace. The end result is an elegant glass-enclosed terrace. Our frameless retractable patio glass is our most stunning and elegant terrace option, with floor-to-ceiling glass that gives you a completely unobstructed view. The Lumon glass terrace is a pleasure to the eyes, to touch, to operate and use for a long time. The enclosed terrace offer spacey, limitless views of your surrounding area. 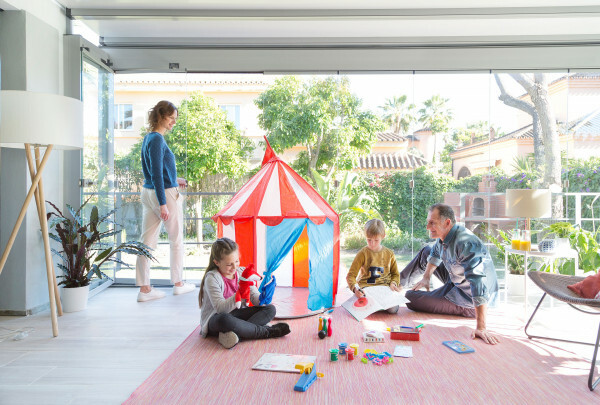 Be part of your natural environment – with adjustable sliding glass elements – for all seasons, all weather conditions or to suit your mood. Meticulous construction, well-finished forms and pristine surfaces bring timelessness and a whole new level of quality. The glass terrace is a joy to use. A key feature is the sliding glass elements which use minimal space and allows maximum usage of the interior. The main door allows easy access. It is designed so children can open it easily – and can also be safety locked. 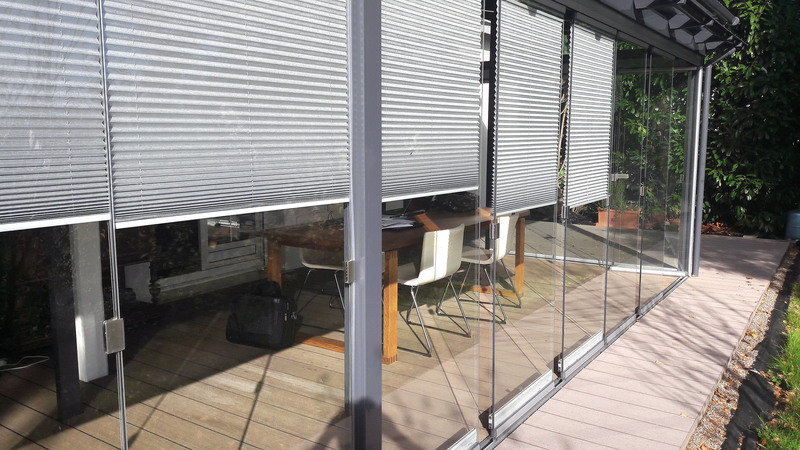 Our glass terrace system can be equipped with fitted sun-protection shades. The shades are movable, and they will be fitted to inside the door units. Lumon glass terraces are an outcome of long-term product development and we have over 35 years of experience designing, manufacturing, and installing solariums and retractable glass balcony enclosures. We take care of every step of the process, supported by the knowledge and experience that has come from more than three decades of research and product development. This uncompromising dedication to quality has paid off. Our glass terraces are unrivaled for their style, price, appearance, functionality, security, and user-friendliness — and we have more than 1,000,000 satisfied customers worldwide who agree. 1 Million Balconies sold - 1 Million Stories told. See some of our balcony and terrace images from all around the world and get inspired. Learn more about us. Read our story. See how we do things and why. Do you like what you see? Do you want to work with us? Become a reseller? Find out how.